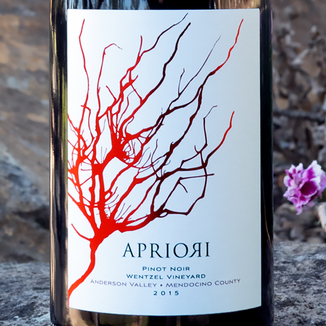 Today’s 50% off blowout special, the delicious Apriori Cellar 2015 Anderson Valley Wentzel Vineyard Pinot Noir was the smash hit of our recent tasting panel. This wine, made by the legendary 100 point winemaker, Philippe Melka, is a delicious, elegant, berry-laden treat, from start to juicy finish. 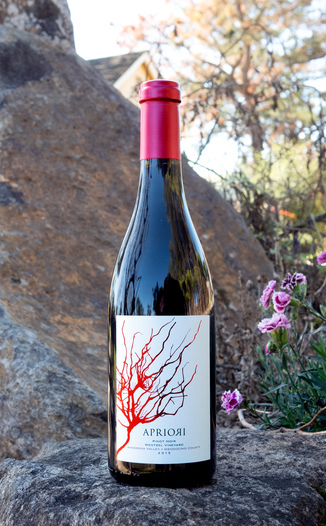 This Pinot Noir lights up the glass delightfully with a smooth gradient of garnet to fuchsia. The nose is refreshing, clean and bright, carrying enticing aromas of violets, fresh plum, rhubarb, and floral essence of gardenia and rose. Taking a sip immerses your palate in a medley of fresh berry flavors with cherry and raspberry holding court joined in by yellow plum with some subtle vanilla and light oak. This wine is delicious, but its main strength is the wonderful silky mouthfeel with the pitch-perfect tannin that undergirds the wine. Try this with a delicate soup, such as a Thai Tom Kha Kai coconut milk soup. A native of Bordeaux, Melka grew up intrigued by the intricacies of the land around him. When it came time for college, he acted on his childhood interests, earning a degree in Geology at the University of Bordeaux. A class in winemaking in his final year was a turning point, propelling him to earn a Master’s degree in Agronomy and Enology. 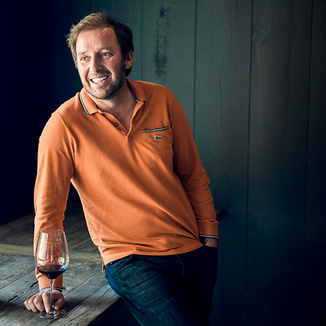 Melka has the rare combination of talent and fortune to be a winemaker who started at the top: his first job out of school was at Château Haut Brion. From there, he took a position with the reputable Moueix Company and was sent to Dominus Estate in Yountville to study soils in 1991. Napa Valley soil proved to be a revelation for Melka. He set out traveling, dividing time between soil study and winemaking at world-renowned wineries Badio O Coltibuono in Chianti and Chittering Estate in Australia. He returned to France in 1993 to deepen his expertise at Chateau Petrus. He has been fortunate to have been trained and influenced by some of the most notable personalities in the wine business such as Jean Delmas and Jean Philippe Masclef from Haut-Brion, Christian Moueix and Jean Claude Berrouet from Petrus, Paul Draper from Ridge, Daniel Baron from Silver Oak and the globetrotting wine consultant Michel Rolland with whom he continues to work with on consulting projects. 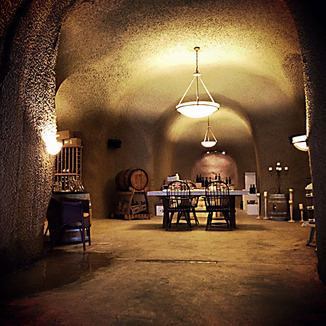 This pristine Alexander Valley location is home to some of the finest Pinot Noir grape in the region. Boutique Pinot producers like Waits-Mast, Fulcrum Wines, Halcón, Sean Thackery and others craft high-dollar Pinots from these grapes. Lights up the glass delightfully with a smooth gradient of garnet to fuchsia. Violets, fresh plum, rhubarb, gardenia, and rose. Cherry, raspberry, yellow plum, vanilla, and light oak. Wonderful silky mouthfeel with the pitch perfect tannin that under gird the wine. Try this with a delicate soup, such as a Thai Tom Kha Kai coconut milk soup.